Forty Winks: Quartet San Francisco whoops up 40 years of Manny Santana's career, March 6 at Cabrillo College Theater. How does Manny Santana feel about the upcoming 40th anniversary celebration of his career in Santa Cruz County? With a guffaw and a four-letter expletive. March 6 has been dubbed Manuel Santana Day by Santa Cruz Mayor Mike Rotkin, the date inspired by the four decades Manuel's Mexican Restaurant has flourished on the ocean side of Highway 1 in Aptos. Cabrillo College's Distinguished Artists series is hosting a concert that evening by Quartet San Francisco, featuring principal violinist Jeremy Cohen, well known for his country and jazz fiddle styles, which he brings to bear on even the hoariest of classical repertoire. The concert will be immediately followed by a gala reception for Santana at the Sesnon House across Soquel Drive from the college theater. The reception may overshadow the concert. (Accolades began pouring in weeks ago.) It will include a display of his recent art works and a dessert of the irresistible flan that has contributed to his distinguished figure. His now-legendary restaurantsManuel's, Jardines de San Juan and the lamented La Manzanagave him the wherewithal to raise his children, pursue his activism on behalf of educational opportunities for the county's rural residents, including its farmworkers, and continue with his art, which he studied as a young man in his native Los Angeles. Among his proudest accomplishments were his two terms as president of the Cabrillo Music Festival. Cabrillo life member Marion Taylor recalls, "Alicia, Manny's late wife, was the music lover, but when we needed a vision for the festival, Manny came on the board as president." She explains, "Gerhard Samuels, the founding music director, was doing operas. His successor, Carlos Chavez, wanted to do Mahler symphonies. We couldn't afford those big productions." 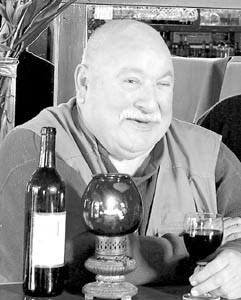 Dennis Russell Davies was hired in part because of his successes with the St. Paul Chamber Orchestra. Years later, near the end of Davies' tenure, the festival was held in a large tent at UC­Santa Cruz. Taylor says, "The tent was a financial disaster, so we asked Manny to come back as president. He saved us a second time." Earleen Overend, who has served the festival as both executive director and board president, unearthed Santana's original vision statement, from his first term as president. "This is not just a concert series, but specifically a series of musical events that clearly explores universal directions in contemporary 'classical music.' We must assume that our audience has the potential for exploring the musical idiom. There is a universal necessity to foster and use the arts to integrate human emotional life and external social production. The language of art beyond immediate social necessity completes the human potential and extends our capacity for personal and social empathy," his vision statement read. These days, Santana spends most of his free time in his studio creating art. "All of a sudden, there's interest in my work," he says, by way of prefacing his current adventures in Mexico. Last spring, he was picked by Mexico's national Bellas Artes to take his works to 13 Mexican cities, beginning with Oaxaca. "It's a wonderful program," he says. "They don't have a lot of money, but there's a tremendous amount of interest." Now, Santana travels to Mexico every month and a half to open his show in a new city. He loves it, he says, "... as long as I remain manic." In a catalog of his traveling show, Overend contributed a personal assessment: "Manny's desire to explore the potential of the people in the world around him seems to be his life's challenge. As his friend, you are constantly called upon to meet this challenge and respond. But this desire is only an extension of the challenge he demands for himself. In the many facets of his life he sets the bar high and then reaches beyond it. He has an unquenchable zest for life." Santana speaks with equal enthusiasm of Overend, and of Ernest "Bud" Kretschmer, who was active in founding the festival before Santana came on board. In his memoirs, Kretschmer says, "Manny ... had a vision and a way of expressing it that was unique. He was a very articulate person, sort of a philosopher. He's been a generous contributor and an outstanding person." Acclaimed Cabrillo Festival music director Marin Alsop uses fewer words than many of Santana's fans, but with similar punch. "Manny is an amazing artist and human being. His curiosity about all things and compassion for fellow human beings is unrivaled. He's been a consistent supportive presence at Cabrillo for decades and we all adore him." Quartert San Francisco, directed by Jeremy Cohen, performs Sunday, March 6, at 7pm at Cabrillo College Theater, 6500 Soquel Dr., Aptos. Tickets: reserved $24/general, $20/students and seniors; unreserved $18/general, $14/seniors and students; 831.479.6331.